Today we crossed the great state of Washington and eased across the border well before dusk. We dropped off Buck's bike at The Repair Man Ladner in Delta, B.C. to be shipped back up to Quadra Island to await a future adventure. We then had to maneuver through the pau hana traffic in Vancouver to drop off Nick's bike at the shop near Stanley Park. Well, let me tell you, getting through Vancouver at rush hour is predictably tedious, but when it happens to be the evening of the Stanley Cup Game 1 Finals for the Canucks playing at home vs. the Boston Bruins and everyone is rushing to get in front of a TV in time for the 5:00 puck drop... Well let's just say that Canadians have taken grid lock to new heights. 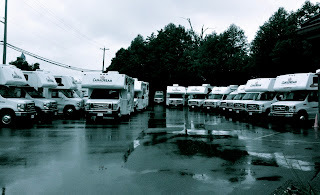 At all events we made it across the Lions Gate Bridge to West Van and settled in at the Capilano RV Park before dark. Had a delicious dinner at the Cactus Club Cafe and shared in our Canadian hosts' joy at the Canuck's victory with 20 seconds left in the game. "Where ya been, Bigfoot?" If they only knew.